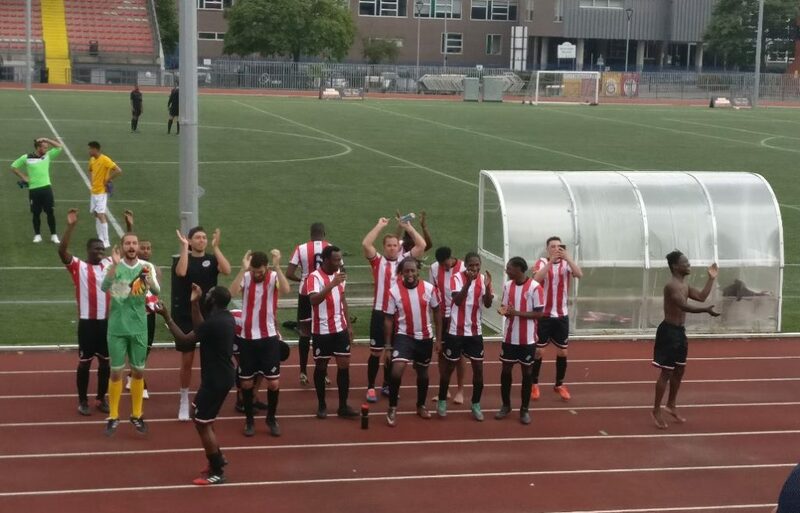 Clapton notched up a second win in 7 days on Saturday, with an impressive victory over MCFL Div 1 counterparts, NW London, at the vast New River Stadium. Our second visit to North London in a week saw Geoff Ocran’s team put in arguably their most complete performance of pre-season to date against well drilled opponents. The manager’s line-up is starting to look settled from one game to the second, with the only new recruit, forward Bogdan Bivolaru, making his debut from the bench. NW London represented the ideal test for us to get a better idea of what lies ahead in the upcoming domestic campaign, having placed 7th (out of 12) in our division last season. The hosts, whose international lineup included 4 Brazilians, among 9 different nationalities, played neat attacking football, and looked dangerous on the break. However, It was a slip up at the back that let Clapton in for in for the game’s opening goal. A speculative ball played over the top, which looked like a simple take for the defender, before a stumble, allowed in the prowling Eliot Crosbie, who didn’t blink with just the goalkeeper to beat. Clapton continued to press after the goal, along both wings and through balls floated in from midfield, before Crosbie netted again, his fourth goal for the club. Another pass sent from deep landed directly on Eliot’s right foot, before the big number 10 shifted his weight and finished powerfully with his left at the ‘keeper’s near post. Tons fans could have been forgiven, at this point in the game, in thinking a big score was on the cards. NW London were determined to remind us all that they were very much still in the game. Goalkeeper, Vlad Bendovskyy, made a number of fantastic saves during the first half, with NW’s Victor Lourenco giving the Clapton defence real cause for concern. It wasn’t long before the North West Londoners did get their goal, just before half-time, to great cheers from the small band of supporters in the giant stand opposite. That goal seemed change the balance of the game, as NW came out for the second half a lot more challenging and comfortable in attack. Dean Bouho, relatively new to playing at CB, looked assured screening balls at the back, while Vlad in goal continued to impress. 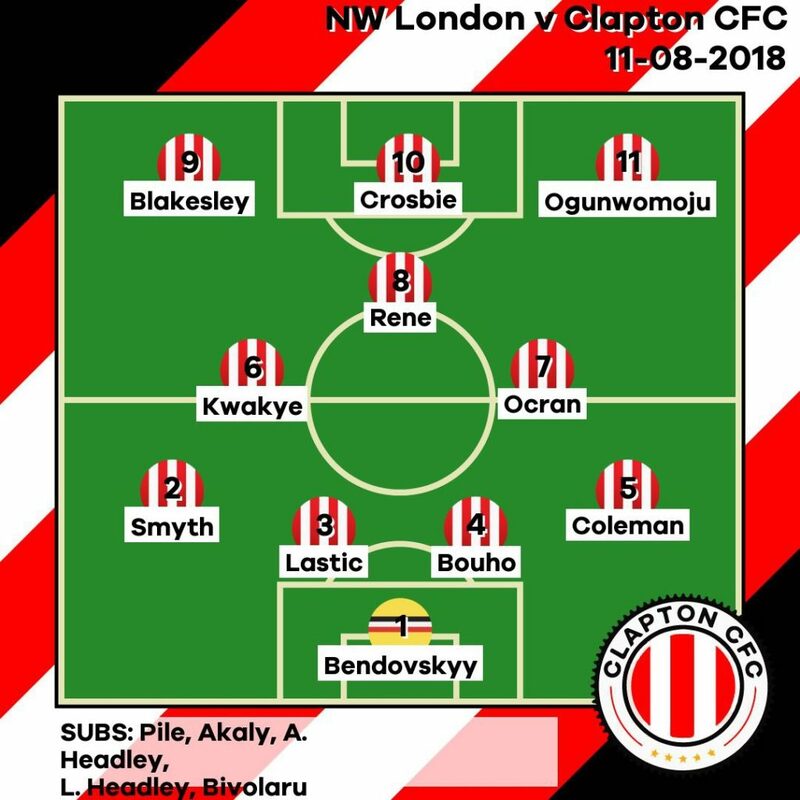 Having given away a bit of territory in the second half, Clapton remained balanced and kept their shape well, even as substitutions on both sides broke things up. It was Tons’ substitute winger, Jon Akaly who eventually settled score, though, in the last third of the game. Ocran’s pressure on the opposing defender initially created space for Akaly, before a well worked 1-2-3 with fellow sub Bivolaru and Crosbie provided Akaly with the ball, who neatly pirouetted before sending a low shot into the far corner to score. Clapton held on for the win to set up next week’s friendly match away at future Anagram Records Cup opponents, Epping Town. We’re here with goalkeeper Vlad Bendovskyy and player manager Geoff Ocran after our first test against a team at our level – a 3-1 win against NW London with goals from Elliot Crosbie (2) and Jon Akaly. After the game, Ocran remarked that NW London were probably the fitter of the two sides, but delighted in his team’s discipline in keeping their shape.